Vietnam is incredible and still authentic – it’s not “spruced up” for tourists. Nowhere is this more obvious than in the Mekong Delta, with its floating markets, where locals live, work and earn a living from the many tributaries of the river. You can easily get a feel for the real workings of this country and how things are done. Here, everyone is an entrepreneur of sorts! As the food basket of Vietnam, the Mekong Delta covers an immense area winding its way over 3000 mi. from Tibet through Cambodia to Vietnam’s Peninsula, where it spills into the South China Sea. It is marvelously fertile, and views here are all related to riverside life, orchards, rice paddies and any food-related small industry. From snakes swimming in whisky to coconut candy, everything here reflects the flavors of Vietnamese culture. The floating markets in the Mekong highlight the shape of life here, where people live, shop, sell and eat from and in their vessels and homes on the water. Getting to the area involves a lot of boat/bus/ferry/foot combinations, but its well worth the effort. We arrived from Saigon on our 3-day trip, which included Can Tho and Vinh Long. The journey down was a long, hobbling, creaking bus ride, passing paddy fields and other fields with every variety of food being grown here. We stopped for lunch in Vinh Long. We walked around the “land” market of local shops with their goods set up in baskets on the street, where all kinds of colors and scents greeted our senses. A small motor launch took us along a peaceful tributary (away from the madding crowd of the main river) where each bend brought a new surprise and gorgeous scenery before we reached the home of a local farmer for lunch. We arrived in vibrant Can Tho, the delta’s largest city, in the late afternoon and spent the time exploring this busy and lively port city. We rose the next morning at 4 am in raw anticipation. 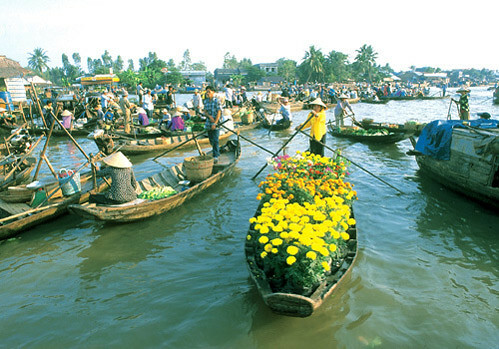 The day on the river begins at the crack of dawn and floating markets are held every morning from about 5 am till noon. We got into a small motor boat and made our way up the river to our first “stop” – the Phung Hiep market, the largest of the floating markets, located at the crossroads of 7 major canals. The picture that greeted us was like laundry hanging out to dry. A maze of hundreds of sampans spread out on the busy river, hoisting samples of their wares on towering bamboo poles, to be seen from a distance. Coconuts, melons, mangoes, a heap of turtles, snakes, vegetables, fish, urns and vases and so much more all piled high on the vessels. A beehive of activity where traders snapped up everything by the bushels to resell at local markets; where smaller merchants weaved their way between larger boats and suddenly, a spectacle of pineapples or cabbage flying through the air between vendor and shopper. In between, floating restaurants, floating bars, floating gas stations and many other floating shops winding deftly between the boats. The lively, near –frenzied pace here was an unmatched view into local culture. We made our way to land for an afternoon cycling trip through the quiet lanes near Can Tho, biking through small villages and beautiful countryside, and in spite of the language barrier, meeting some very pleasant and friendly people. Early the next morning, we visited the Cai Rang floating market for a second taste of this experience. Primarily a produce market, it is always busy, bearing all the characteristics of local life. After the market, we visited some small home industries where villagers made everything from coconut candies to rice paper. We ended our trip with a trek through lush orchards and bee farms. The highlight of the afternoon was a visit to the Dong Nam snake farm, where over 20 varieties of venomous snakes are used in drinks and food for medicinal purposes – some soaked in large flasks of whisky! 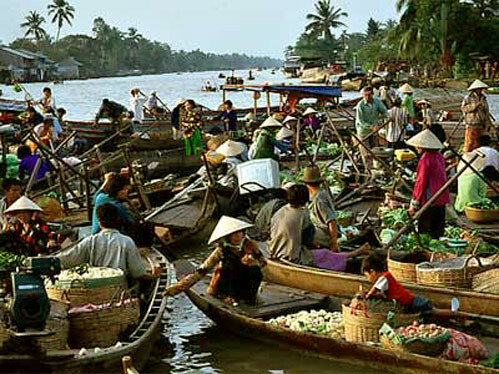 The Mekong Delta, with its hustle-bustle, its genuine locals, its overgrown streams and great scenery, and above all, its characteristic floating markets is one of the most fascinating parts of this fascinating country and a springboard for getting to know Vietnamese culture and its people up close.